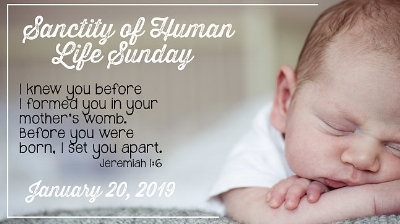 On January 20th, churches of the Baptist Convention of New York territory will recognize the Sanctity of Human Life Sunday. For some women this can make the difference of choosing life or not. It is an opportunity to speak the truth in love about abortion. It is an opportunity to stir in someone's heart the need to make a difference in the life of a woman and her expected child. In America alone, there are almost three abortions every minute. That is 3,400 lives a day that are taken. Be a part of changing this statistic for 2019 by learning, praying, giving, and serving. 3,400 abortions happen each day in the US. That is almost 3 abortions every minute! 93% of abortions happen because of an unwanted pregnancy. Ronald Reagan established Sanctity of Human Life Day, continued with George H. Bush, was discontinued with Bill Clinton, and brought back with George W. Bush. Every abortion represents two lives: the child and the mother. Reaching out to the mother can result in saving a child. What can YOU do? Pray, give, reach out, and volunteer. PRAY ... for women who find themselves in a circumstance they feel there is no way out but abortion... God provides another answer... LIFE! Contact your local Pregnancy Care Center to learn how you and your church body can be involved in this beautiful ministry. Focus on the Family - A variety of resources including printable materials and videos. You can also find an excellent outline of the history of abortion along with some of the latest statistics on the pro-life page of their site. They have produced a great video on the dignity of human life that you can download here. Psalm 139 Project - The Psalm 139 Project is an initiative designed to make people aware of the life-saving potential of ultrasound technology in crisis pregnancy situations and to help pregnancy centers minister to abortion-vulnerable women by providing ultrasound equipment for them to use. This project provides a way for motivated individuals to assist financially in the placement of ultrasound machines in qualified pregnancy care centers. Heartbeat International - This organization provides much of the training for pregnancy care centers in America. There is a list of 8 ways YOUR church can specifically help end abortion locally and internationally. Life Matters Worldwide - A variety of resources for your church are available for download or ordering. International Helpline - Help in recovery from an abortion. Lifeway Sunday School Lessons: Lifeway Christian Resources has a good number of lessons available for teachers on their website here.